Classic novelty Marine 38 from Steinhart.German watchmaker Steinhart Marine model is 38, decorated in a classic style. German watchmaker Steinhart Marine model is 38, decorated in a classic style. No unnecessary elements in the design of new items not. These watches are specially for those people who appreciate the strict classical style that is relevant at all times. Round case with a diameter of 38 mm and 13 mm thick made of polished stainless steel. 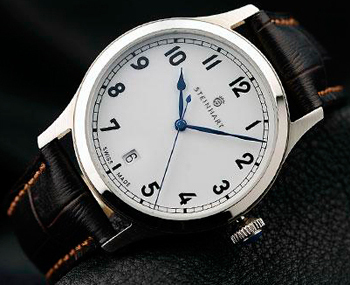 To mat – white dial are very nice black Arabic numerals and blued three central hands. Steinhart company logo adorns the dial in the position of “12 hours” and in the “6:00” is available square aperture date. New Marine 38 is equipped with a Swiss ETA 2824-2 automatic caliber with trim Elaboree. Mechanism with automatic winding rotor, blued collected by 25 stones, has a frequency of 28,800 vibrations per hour, 38-hour power reserve, as well as functions: hours, minutes, seconds, date.